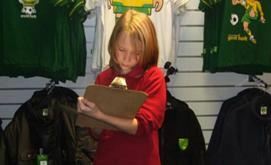 The Norwich City Football Club Study Centre offers unique, diverse and exciting learning opportunities for school aged pupils. We are experts at delivering short-term programmes which have a big impact on attainment and aspirations. The link to Norwich City FC is sometimes all a child needs to get them excited and motivated in a way that can really enhance their attitude to learning. All of our programmes focus on supporting children to develop skills in the core areas of the school curriculum. A large proportion of our work is Maths and English intervention, but we also offer a variety of different programmes ranging from Spanish, to food and nutrition. We can either deliver our programmes at our Learning Centre based within Carrow Road; or we can come into your school during curriculum time and deliver intervention work. We also offer a wide range of resources and methodologies that schools can use at a time and pace to suit them. The NCFC Study Centre has a ‘no limits’ approach to education - a learning experience with us could be a few hours, a day or a whole term. Contact us for a quote for individual programmes.